If you’re looking to stay in your home throughout your lifetime, or want to build a new home to stay in, then pick up a copy of the new AARP Guide To Revitalizing Your Home: Beautiful Living for the Second Half of Life. Learn from noted certified interior designer, gerontologist, author, speaker and consultant, Rosemary Bakker, what home modifications you can do on any budget to make your home more accessible, safe, comfortable and convenient. As an adjunct research associate at Weill Cornell Medical College, Baker is a researcher and teacher in environmental design. She brings a comprehensive set of solutions to anyone who is planning to update their house, remodel or build a new home. 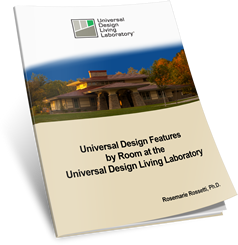 Learn the latest in universal design and see for yourself how beautiful a home and garden can be when smart design is incorporated. The high-quality color photos throughout the book illustrate the recommendations that she brings to the forefront. Baker simplifies interior design principles by showcasing beautiful interiors and gardens. There is an abundance of helpful hints that will add value not only for the seniors and people with disabilities who live in the home, but for everyone. Of special note are the hints to prevent falls, electrical shock, and getting burned in the home. This guidebook includes ways you can have a greener home—one that uses less energy and water. You will pick up tips on how to save energy through lighting, window, door, and appliance selection. You will also learn how to select toilets, faucets, and dishwashers that use less water. Bakker’s chapter on kitchens includes a discussion on design, lighting, appliance selection and flooring. Through the photography that she has chosen you will learn how to design your spaces. It will be obvious to any reader that universal design is practical as well as beautiful. 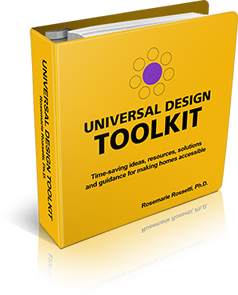 Bakker first learned about universal design about 25 years ago when she attended a session on universal design at an interior design conference in New York. It immediately made sense to her to that we should be designing interiors, buildings, and products that could be used by a broader range of users, not just a narrow user group who have no limitations in visions, hearing, and mobility. She learned how home design intensifies a person’s disability by watching her nephew who has spina bifida and her mother who had Alzheimer’s disease. She realized first-hand how the role of the environment can either enhance quality of life and function or create unnecessary struggle and loss of function. This experience was the motivation for her to go back to school and get a master’s in gerontology and write her thesis on Environmental Design for An Aging Society. To order this 208 page 8 ½” x 11” paperback, look at book sellers on the Internet and at local bookstores. The book price is $24.95. Publisher: Lark Books. ISBN 978-1-60059-280-5.